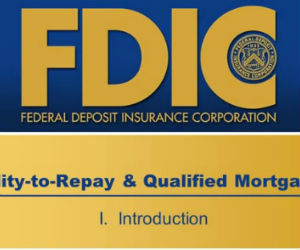 The FDIC has released a set of instructional videos that address ability-to-repay (ATR) and qualified mortgage (QM) rule compliance. Check out the first video below, which introduces the three-part video series covering compliance with the mortgage-related rulemakings issued by the Consumer Financial Protection Bureau. The video series is designed to help mortgage professionals understand how to comply with these rules. The series begins with the ATR/QM rule. Click here to view all of the FDIC's instructional videos.